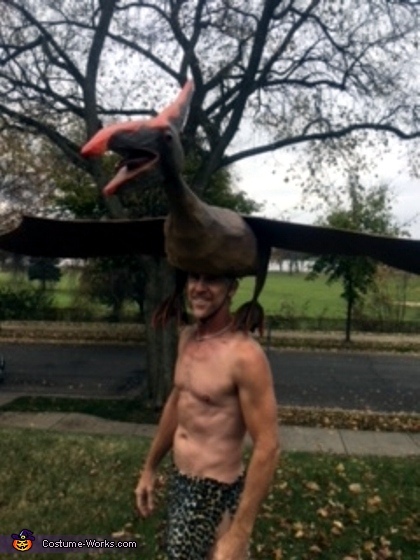 The inspiration for this costume came from a pterodactyl plastic toy that I had attached to my bike during a festival. People got such a kick out of it, it gave me the idea to do something bigger. The idea of making a headdress was the perfect way to wear the pterodactyl. More thought made me think I should be a caveman that was being picked up by the creature. I started with a safari hat I had in my closet. I built the base and structure entirely out of cardboard. I carved out some foam to add dimension to the head. I then covered it in 2 coats of paper mache. I gave it a coat of spray paint but then hand painted on more depth and details. The eyes are craft eyes meant for stuffed animals. I took one tomato cage, cut it in half and shaped it for the wings. I added a lightweight fabric on top of this. The wingspan is 6 feet across. In order to make the wings move, I created a mechanism in the center of the piece that allowed me to pull a string under my chin and create an up and down movement. This piece was made out of mostly recycled materials. I only had to purchase the fabric, the eyes and some paint which came to around $30. People were in awe of this costume. I heard comments such as "epic" and "you just won Halloween!" LOTS of people asked to pose with me for a photo. And everyone was amazed to learn that the wings actually flapped.